Carved by artisans in India, this challenging puzzle asks that you complete the maze with steel marbles. Throughout history, labyrinths have often been used as a form of meditation, with their twisting paths freeing the mind to contemplate higher things. This labyrinth, however, is much more likely to raise your blood pressure. It's a challenging puzzle, where you guide five stainless steel balls through a circular track. The path is difficult, but you can find great inner contentment once you have coaxed all five pieces into the center ring. 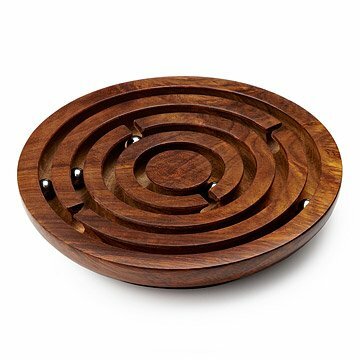 A beautiful addition to any office or countertop, the game is handmade by artisans in India using sustainably harvested sheesham wood, a kind of rosewood known for its beautiful grain. These artisans, often without education or with health-related issues, are able to use their craftsmanship to find their way out of poverty. Made in India. Clean with dry cloth or wood polish. This a challenging game testing a persons ability to navigate a marble through a maze. A combination of motor skills and patience are extremely helpful but I think anyone would enjoy trying their hand at maneuvering the marble from start to finish. Fun, quiet puzzle that is not easy to solve. Perfect gift for puzzle enthusiasts who love to be challenged. I solved it in 10 minutes. The wood is sturdy and lovely. This will not fall apart after only a couple of uses. The game is challenging and fun. I tried it first to make sure my family will enjoy this and I know they will!